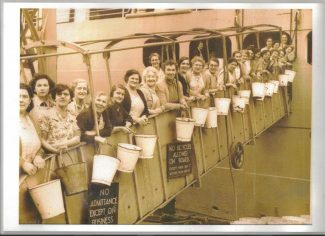 This fabulous photo shows local women armed with their buckets to go on the ships in Tilbury docks to make them squeaky clean!! Do you recognise any of these wonderful hard working women? my nan Iris Malthouse was a charge hand on the swedish lloyd ships cleaning them when they came into port and my mum also worked on them. Her name was Pearl Malthouse. My mum was a ship scrubber for many years, although she isn’t in this photo for some reason. Her name was Flo Hollands and she later worked on the Swedish LLoyd line cleaning their boats. They used to arrive at the landing stage on a Tuesday, Thursday and Saturday I believe.